What have the foreigner investors been selling? The clever folks at Asia Plus Securities put this out earlier in the week showing what foreign investors have been selling in Thailand during the month of November. And the damage is clear to see, telco’s especially ADVANC are being hurt badly followed by the banks, why? We hypothesize that well both sectors are overvalued, two, if you were a mutual fund manager overweight Thailand and you had to go to neutral weighting which positions are the most liquid, the banks (no more corp income tax reduction boost) and telcos (will ADVANC and DTAC have to invest in their own towers?) have below average growth for next year. Random Thoughts: Lots of Instagram users = Good thai stocks? 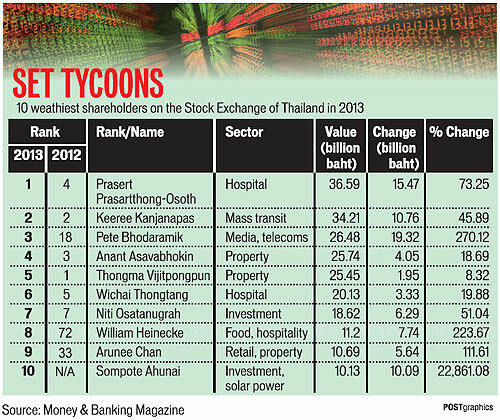 Well Money & Banking came out with their latest analysis showing the top wealthiest investors/families in Thailand and here’s the list below. What catches our eyes other than BGH yielding two of the wealthiest investors in Thailand (#1 and #6), are firstly, how JAS’s owner got into the top 10, we’ve gone on long and long enough about JAS here in the past and with them trying to pull off an infrastructure fund similar to TRUEGIF, which itself had issues and difficulties coming to market, we doubt JAS can pull off a successful infrastructure fund and we still don’t understand its valuations nor its profitability for that matter.